Thai coconuts have thinner husks, making them easier to handle and cut into, and their interiors are filled with coconut water and a gelatinous meat. The coconut water can be drunk straight or seasoned in a variety of ways, while the meat may be eaten as a snack. 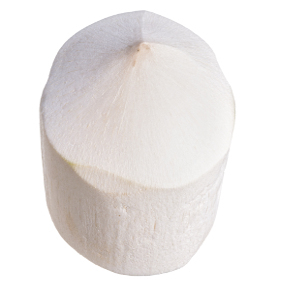 The young coconut is one of the most important fruits within the tropics because of its potassium and mineral rich water. Handling: The product shelf life is 2-3 weeks after purchasing. Always store the Thai coconuts in the refrigerator, and they will keep the longest.